Hafnium Dioxide, HfO2, is a high-index, low absorption material usable for coatings in the near-UV (~250 nm) to IR (~10 μm) regions. Dense layers with good hardness can be deposited by electron-beam evaporation or by sputtering. Typical applications include near-UV laser AR and dielectric mirror designs. 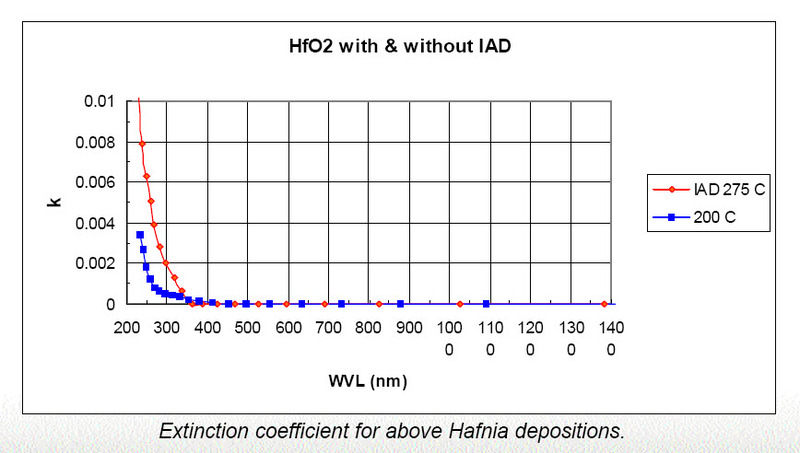 Hafnia is the high-index component used in combination with Silicon Dioxide layers to produce coatings with high laser damage thresholds. Hard, scratch-free, dense and adherent coatings can be deposited on relatively low temperature substrates with IAD. Its abrasion resistance provides protection for metal mirror surfaces. 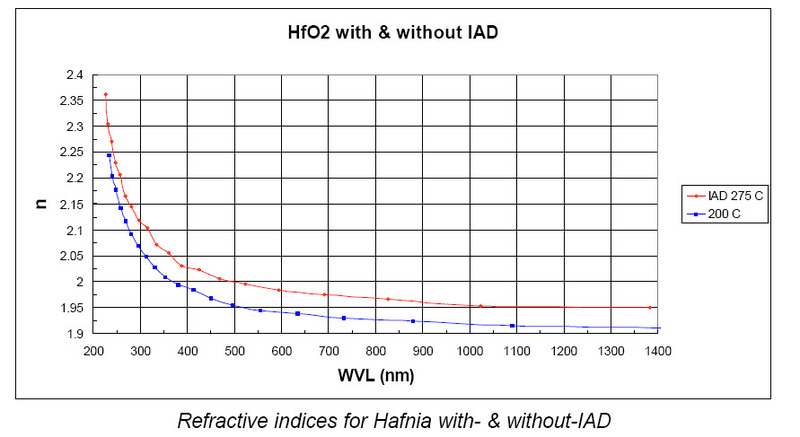 Completely oxidized Hafnia films are absorption-free over the range below 300 nm to at least 10 μm. Evaporation causes some amount of dissociation and oxygen loss, which must be restored by supplying a partial pressure of oxygen during reactive deposition. Adhesion is excellent to glass, most other oxides, and to metals such as Aluminum and Silver. Under low energy evaporation conditions such as low substrate temperature, or with excessive background pressure, the films grow with a porous crystalline microstructure of low packing density and can exhibit index changes when vented to moist air. It is recommended that high energy deposition techniques such as IAD or sputtering or high substrate temperature be used to decrease the open void volume by increasing the packing density of the microstructure. Post-deposition baking in air can raise the refractive index of electron-beam depositions. Some amount of index inhomogeneity can appear with increasing layer thickness or layer number as the material is consumed. The effect can be reduced by providing sufficient oxygen backfill during evaporation while avoiding excessive background pressure. IAD often improves homogeneity. For critical applications where the incorporation of microparticles can reduce the laser damage threshold or increase light scatter, reactively evaporating Hafnium metal in an oxidizing atmosphere is recommended for producing particulate-free films. The refractive indices are dependent on the degree of oxidation and the film density achieved. These properties are determined by substrate temperature and deposition energy. Two dispersion curves show with and without-IAD conditions at two high substrate temperatures. An index increase of ~2.5% is produced with IAD. The increase in extinction coef., k, is evident when IAD is employed. Without IAD, the absorption is very low down to wavelengths ~250 nm. Recommended preconditioning consists of sweeping a low power electron beam to slowly and uniformly melt the material tablets or piece forms without boring a tunnel. Considerable oxygen reduction occurs, and the melted charge turns black. Alternatively, a pre-melted cone can be used. Monitor the pressure and crucible to decrease outgassing and spitting to an acceptable level while slowly increasing the power to just below evaporation temperature. 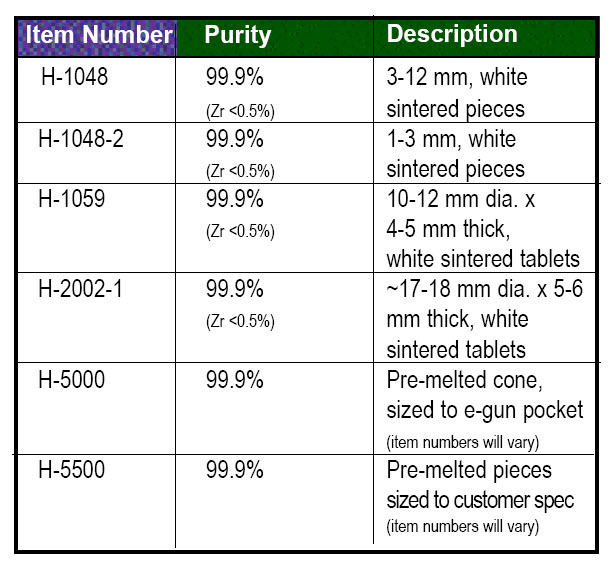 Tablets or pieces can be added to refill the crater left in the melted plug, and must be melted down to a flat surface for subsequent evaporations.